Whitman has an advantage over most Republicans in choosing her general election strategy in this year of conservative vengeance against moderation: her virtually limitless money, which will bankroll not only her own campaign, but the get-out-the-vote efforts crucial to the entire GOP ticket. This has put something of a damper on right-wing demands on the former eBay exec at the Republican confab. 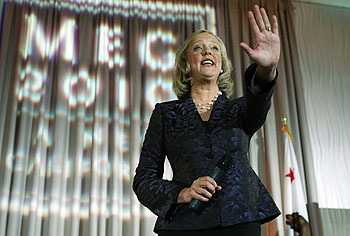 ….Uniquely in the Republican politics of 2010, Meg Whitman has the freedom to swing towards the center if she wishes, so long as she keeps her checkbook open and meets the easy test of being more orthodox than Arnold Schwarzenegger. Conservatives may grouse and pine for a mighty warrior to smite the anchor babies and the tree-huggers and the abortionists of the Golden State, but they are signed on to eMeg’s wild money-fueled ride, wherever her cold-blooded pollsters take them. There was a blond sitting at a Lake Tahoe waterfront bar recently who had Jerry Brown’s problem nailed. “Millions of Democrats are waiting for a reason to vote for Jerry Brown and he isn’t giving them one,” she said, interrupting the tortured analyses spewing from me and some other political junkies. The woman didn’t want to be identified by name. But, OK, she’s my wife. And she’s usually right about these things, largely because she has a normal life outside politics and punditry. I’d amend her assessment to include not only Democrats but also independents and moderate Republicans. They’re all waiting for the Democratic candidate to get a move on and finally tell them why he’d be a better governor than Republican political novice Meg Whitman. This is the damnedest campaign I’ve seen in a long time. Granted, Labor Day isn’t until next week, and Brown simply doesn’t have the kind of money that Whitman does. But so far I’ve barely heard a peep out of him, and the peeps I have heard have been nothing more than the most soporific kinds of generalities. It’s almost as if he’s decided he’s too tired to bother campaigning at all, and that’s really not the image a 72-year-old career politician wants to send out. I sure hope there’s some kind of deep strategy here that I’m not privy to. Whitman is a deeply cynical campaigner, but she has enough money to keep most of the public from seeing that. If Brown doesn’t start beating her up soon, it’s going to be too late.